4-Cyl, MultiAir, 2.4L, ABS (4-Wheel), Air Conditioning, Alloy Wheels, AM/FM Stereo, Anti-theft System, Automatic, 9-Spd, AWD, Backup Camera, Blind-Spot Alert, Bluetooth Wireless, Cruise Control, Daytime Running Lights, Dual Air Bags, Electronic Stability Control, F&amp;R Head Curtain Air Bags, Heated Seats, Hill Start Assist Control, Keyless Entry, Keyless Start, Orange, Parking Sensors, Power Door Locks, Power Seat, Power Steering, Power Windows, Rear Spoiler, Side Air Bags, SiriusXM Satellite, Tilt &amp; Telescoping Wheel, Traction Control, Uconnect OUR 2016 FIAT 500X EASY AWD IS A GREAT CAR FOR GAS SAVERS CAR!! IT IS ONE OWNER AND WELL MAINTAINED CAR FOR EVERYDAY DRIVE! GREAT DEAL FOR GREAT CAR! IF YOU DONT WANT TO THINK PARKING THIS IS THE RIGHT CAR FOR YOU!! PARK IT ANYWHERE. IT HAS GREAT COLOR COMBO WITH TWO TONE BLACK-GRAY INTERIOR... IT HAS BACK UP CAMERA, BLIND SPOT, U CONNECT 6.5U BLUETOOTH, AUTOMATIC HEADLIGHTS, AUTO DIMMING MIRRORS, DAY TIME RUNNING LIGHTS, SD CARD READER, LEATHER STEERING WHEEL, KEYLESS ENTRY, CRUISE CONTROL, AC, CD, HD RADIO AND MORE. CALL FOR THIS LITTLE CUTIE TO TEST DRIVE IT AND GUARANTEE TO FALL IN LOVE!. Financing rates starting from %2,99, Bring us your trade in and TAKE this beauty home. Divorced ok, Bankruptcy ok, Bad Credit ok, No credit ok.
We Finance Everyone!!! Carfax Certified Vehicles. 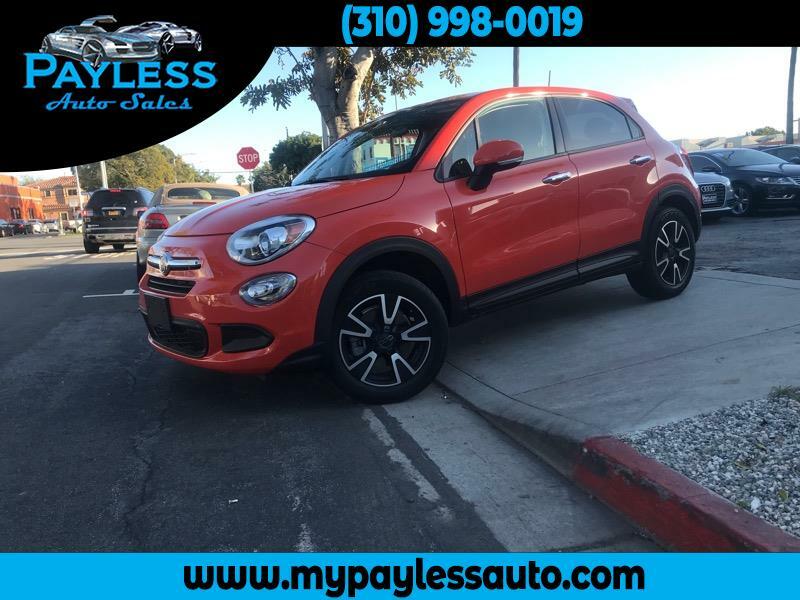 Visit Payless Auto Sales online at mypaylessauto.com to see more pictures of this vehicle or call us at 310-998-0019 today to schedule your test drive. Message: Thought you might be interested in this 2016 Fiat 500x.